Though it made its encouraging Paris debut in 2000, it has taken the Japan-based fashion group Onward almost two decades to deliver its second act – this time, in London. It’s been worth the wait, however. 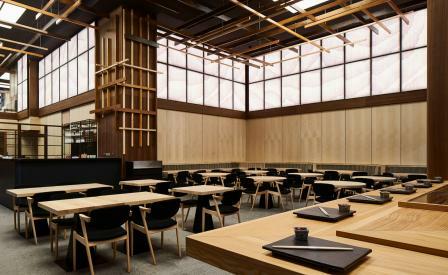 Set in a new build by the Berkeley Group that was designed by Grid Architects, Yen is a stark visual departure to the more prosaic dining offerings in the Strand and Aldwych neighbourhood. London-based architects Sybarite have accented the high ceilings with a see-through canopy of maple rods and columns of irregular lengths and widths, that’s meant to evoke a bamboo forest. The arboreal effect is accentuated a warm colour palette of browns and greens, back-lit wall panels made of metallic hand-painted wallpaper, and low-slung blonde timber furniture. A floating timber staircase – styled almost like an abstract village fence – spirals up over a bijou pebbled garden to a cocktail bar, and the main dining room where the star attractions are the light flooding in through a bank of high-set clerestory windows and the soba buckwheat noodles, the latter made onsite in a glass show kitchen before service, and served alongside the usual suspects of sashimi, sushi, robata and tempura.